Ally, Bree, and Jack have almost nothing in common. Ally’s parents have been working for years to prepare the isolated Moon Shadow campground for a predicted total solar eclipse. She and her brother, Kenny, homeschool, and Ally is far more interested in astronomy and her work at the campground than in clothes, hair, or boyfriends. Bree, in contrast, is an “‘A’ clique” city girl determined to build a career as a model, while dissociating herself from her nerdy family as much as possible. Jack, shy and unsure of himself, has learned that his preference for drawing over homework has earned him a ticket to summer school. But the eclipse is due soon, and things are changing. Jack is invited to trade summer school for a job as his science teacher’s assistant on an eclipse tour. Bree’s parents are taking over Moon Shadow for the next three years in order to do research, so Bree will be homeschooling in the woods while Ally goes to school in Chicago. All three are challenged in their perceptions regarding who they are and what they’re capable of, but two weeks together, waiting for the eclipse, gives them a chance to learn from each other and process these new ideas. Mass creates engaging and likeable characters who demonstrate genuine growth, dependent in large part on an unlikely but believable friendship between the three protagonists. The secondary characters (the girls’ younger siblings and Ally’s friend, Ryan) are also well developed, active players in the story–so much so that it almost seemed odd that they weren’t given a voice. With this in mind, I think that readers as young as ten, especially those with an interest in astronomy, would quite enjoy the novel, without its feeling too young for early teen readers. 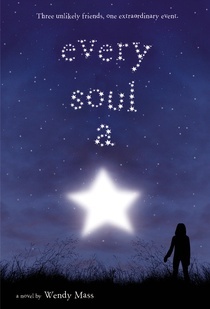 Read reviews of Every Soul a Star from Kidsreads or Librarilly Blonde. It’s not uncommon for parents to play a minimal role — or no role at all — in children’s and YA fiction. It gives the protagonists additional space and agency to explore themselves and their world, and allows readers to do so vicariously. Even so, the parent-child relationship remains an important one for young readers, and plenty of books offer insight into both its challenges and its potential. This week’s Ten suggests that even when parents are distant, even when they break trust, there is a place for hope in love and the possibility of restoration. Merging fact and fiction, Van Dusen’s award-winning The Circus Ship is a dramatic tale of adversity and resilience, kindness and, well, comeuppance. Gorgeous artwork and a spry rhyme render The Circus Ship a successful pick for toddlers (if my 2.5-year-old is any indication!) Bright colours and expressive illustrations lend themselves well to prolonged consideration. Moreover, sleuthing out the animals themselves, mid-story, is sure to be a highlight for children and parents alike. While the length of the narrative somewhat tests the patience of my little one, its overall quick pace and fairly straightforward vocabulary ultimately take her through to the end. This book quickly joined the rank of nightly reads in my household, and I don’t foresee it disappearing any time soon! For additional reviews, see Kirkus and blogger Rummanah Aasi. NB: The cover image has been taken from, and links back to, the author’s website. Liam is twelve, but he looks a lot older. Old enough to be allowed on the big rides. Old enough to be mistaken for a teacher on his first day of middle school. Old enough, when the opportunity presents itself, to play classmate Florida Kirby’s dad when four winning parent-child pairs are invited to try out a brand new, top secret amusement park in the middle of the Gobi desert. As it turns out, the main attraction of this new park is a space shuttle intended to be pilotable by guests of the park — specifically, that is, by children. Although the original plan is for the invited children to test the shuttle alone, Liam manages to secure himself a place as chaperone on what proves to be, not surprisingly, a disastrous trip. 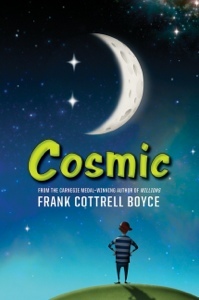 The core of Cosmic is an exploration of what it means to be “dadly.” As an oversized child, Liam is able to look at the role from a range of perspectives — that of a son, certain his father will protect him; that of one of several fathers competing to prove themselves the best dad; and that of one temporarily responsible for parenting four other twelve year olds in the midst of a dangerous situation. The resulting portrait is complex and ultimately affirming, both to parents and to the preteens for whom the book is written. * One more note: These lists are not intended to suggest that the titles presented are the best on the subject. Each list will be compiled based on personal experience and research, and will include only books that we enjoyed for one reason or another. However, our time and reach are limited, and we very much welcome additional recommendations! When the Gentleman bug, an unassuming but beloved teacher, falls for a new Lady bug in town, he tries everything to get her attention. Nothing works, until he discovers that she’s to be the town’s librarian, and the two bond over stories. In Bartoletti’s telling of the Flood story, Naamah (pronounced Nay-ah-mah or Na-ah-mah) is the name of Noah’s wife. One night a great storm sets the ark thrashing on the waves and surrounds it with thunder and lightning. Noah and their children toss and turn on their mats and the animals grow restless, but Naamah, calm and wise, moves through the ark singing blessings over those on the ark and for the world around them. Two by two, people and animals settle in to sleep, comforted by Naamah’s song and by her presence. At last Naamah puts herself to bed and the story closes, just as the reader catches a hint of land in the distance. Though the book’s cover calls Naamah a lullaby, no music is provided or tune suggested. Instead, the rhythm of the lines themselves — which together form what the concluding Author’s Note identifies as a ghazal — effectively soothes the reader (and presumably the listener, as well). It took some time for the illustrations to capture my attention, and at first they seemed rather unremarkable. On closer inspection, I decided that a better term might be “adult” — they are simple and evocative rather than bright or playful, as in most Noah’s Ark picture books. My favourites are the breathtaking images that accompany the chorus — full, two-page illustrations depicting silhouettes of Naamah and one or another pair of animals against a vast starry sky. Read reviews from Publishers Weekly or the blog Waking Brain Cells. An earlier version of this review was originally part of a project on the repurposing of stories, focused on Noah’s Ark. 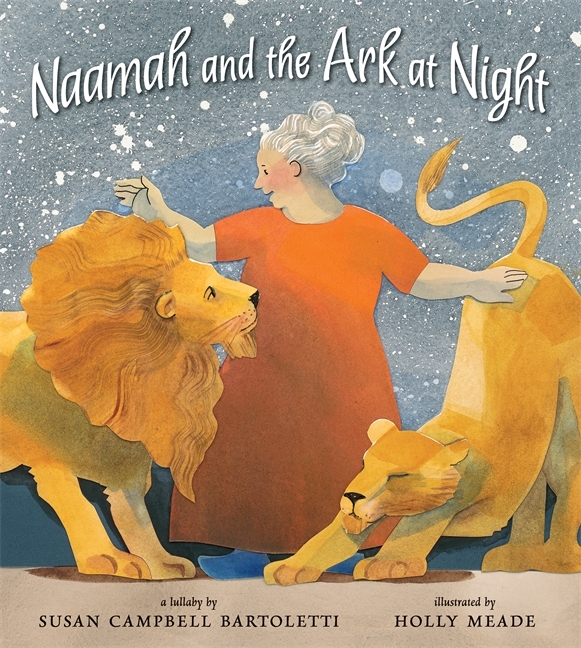 To see more on the subject, including online games, reviews of other picture books and novels, and a glimpse into the vast range of Noah’s Ark-related products available, take a look at the project webpage. Hello! I’m excited to be a blog member with the Lemon-Squash Book Club! My first post is about Foster McFee, a twelve year old girl whose life is full of obstacles. She is challenged by the idea of going to a new school after fleeing with her mother from an abusive relationship. The only mementoes she still had of her father, who died in the Iraq war, were left behind in a pillowcase in the town that she has fled from, and she must learn to cope with only the memories and feelings that she can hold on to. The small town that they move to, however, is populated with individuals with unique personalities, such as Kitty and Lester, two big-hearted individuals who give Foster and her mother a place to stay. In the midst of all of this, Foster’s dream is to have her own cooking show, just like Sonny Kroll, a celebrity chef on TV. Her talent in baking cupcakes wins the support of the townspeople, and with their encouragement, she whips up some fantastic cupcakes in her trailer van home. Though she struggles to read (Foster is dyslexic), her motto of “I’m going to make the world a better place, one cupcake at a time” helps her to gain confidence in her baking and to reach out and work on her reading skills, which unfolds in a nice surprise for Foster. 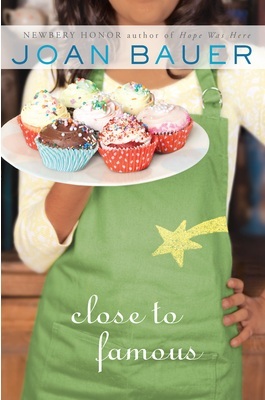 Click here and here for reviews of Joan Bauer’s Close to Famous. Watch the book trailer for this book here.